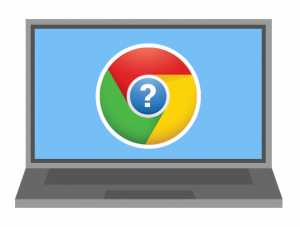 As simple as it sounds, most Chromebook issues are resolved by restarting the device. There is a power symbol along the bottom of the user panel. Click it to shut the laptop down. 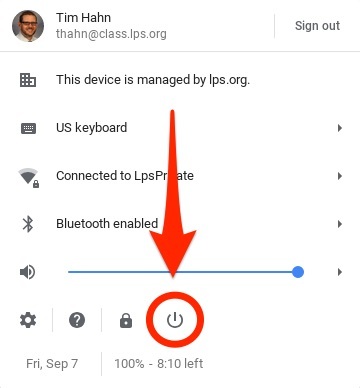 Click the power button on the keyboard to tun the Chromebook back on. If restarting the Chromebook does not resolve the issue, there is a good chance that removing the account and readding it might. You must have internet access to readd the account. Do not take this troubleshooting step if you are not connected to the internet! When the account is removed, all files the user has saved on the Chromebook are permanently deleted. Be sure that you have moved any important files you may have saved in your Downloads folder to your Google Drive before removing the account! REMOVE: To remove the account follow the instructions in this LPS Google Doc. READD: To add your user account to the Chromebook again, follow the instructions in this LPS Google Doc. Google offers support pages that can address most common Chromebook issues. While the directions do not take the LPS environment into account, there are still many good troubleshooting ideas and learning resources here. If none of the troubleshooting ideas on this page address or resolve your issues, your best course of action will be to submit a student Chromebook help ticket at your school. Each school handles these a bit differently, but your Teachers or Librarians will know where to direct you. LPS Computing Services visits each school, each day, to investigate student Chromebook issues. There should also be a supply of “loaner” devices that can be used until your Chromebook is returned to you.